Today I have for you my first Barry M Nail Paint given to me by the sweet and generous Christina from Cel's blog in our recent swap =) I've wanted to try these for soooo long but never got a chance to purchase any. I feel like girlie colours at the moment so I decided to try Barry M Strawberry Icecream. Strawberry Icecream is a gorgeous candy pink pastel. It is such a gorgeous girlie pink and I absolutely love it!! You all know I love my pink shades lol. Like every other pastel pink I know it was a little streaky to apply but it wasn't overly difficult compared to others I own. I used 3 coats (pictured below) for an opaque finish and it dried to a glossy finish. I then stamped the swirly design from Konad plate m36 using Konad Princess Polish in white and topped it with a coat of Barry M Nail Paint in Pink Iridescent Glitter which I also received from Christina. Pink Iridescent Glitter is cute multicoloured glitter suspended in a pink base. It's quite subtle with only 1 coat which is what I was after and it actually toned down the pink of Strawberry Icecream. For the Aussie ladies, Barry M Nail Paints can actually be purchased from Crush Cosmetics or Glover Pharmacy in Galeries Victoria Sydney (more expensive at the pharmacy but you get to see the colours for yourself). I'm so so lucky to have received them in my swap with Christina, it's always so much more special trying things for the first time when someone has given them to you! Do you own any Barry M Nail Paints? What other colours would you recommend? I want MORE! I don't have any Barry M nail varnishes but have noticed they do colours near identical to some chanel colours which is great. I like pastel pinks but a lot of them are difficult to apply. I've not yet tried Barry M, but from what I've seen they have a nice selection of colors and yes, some of them are very close to Chanel colors, which is awesome. Ooh, I love that stamping! I don't have that plate but I really like that design. @How To Be Perfect: I love anything related to food lol. Oh yes Dim Sum Plum is one of my faves! It's such a pretty colour! @Ping: They are just such a pain to apply, I wonder why? I agree, they have such a great selection of colours and the bottles are cute too! @Sup and Bella: You can get Barry M Nail Paints from Glover Pharmacy in Galeries Victoria or online from Crush Cosmetics. The info and links is in the last paragraph of my post above already =) Hope that helps. @Dhini: Glad you like it! thats a SUPER cute pink!~ and the stamp just adds extra cuteness! I just did these nails two days ago and its a wonder we did the same design without the Konad. Berry I/C, a gorgeous pale purple. Also a part of the Summer collection. Shocking Pink, a bright/hot pink. I'm wanting Mint Green but I'm saving up for that. I love this color!!! The name is so yummy as well! Aww, I really want a konad set! 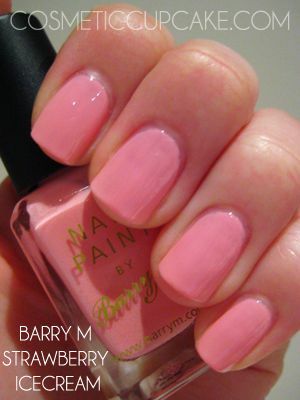 I have been loving Barry M recently. As well as the 2 you used, I have berry icecream which is a nice lilac (I just did a blog post on it), blueberry ice cream, mint green, and a limited edition one that was on offer in Boots over here, which is a darker lilac. I wanted to purchase some of the more pastel colours and Pink Flamingo has been on my lemming list for the longest time! Though I think they are expensive for the size! But I do own one Barry M colour in NAVY! BEST DARK DARK BLUE EVER! @Katrina: It's a very sweet colour =) Thanks Katrina! @AnnKiin's: Ohhhhh I'm envious! The colours look lovely on you btw. Berry I/C is on my wishlist! @Anna: Konading is so awesome, definitely try it out yourself! The colours you have are lovely, I'd love to see the darker lilac. @PinkOrchids: Awwww you're welcome, your blog is great!! Thanks for the recommendation, I'll have to keep my eye out for the blue. @Serena: It's such a gorgeous pink =) Hmmmm yeah other brands are cheaper in comparison but the colours are so sweet! @Katya_noia: You are most welcome! @Joan: I was so excited when I saw the stand in the pharmacy. It's cheaper to get them from Crush Cosmetics though! @Alice: Aren't the bottles cute?? Definitely try them if you can. @Silkybow: I'm glad you like it!! FREAKING love this!! i need it. barry m's are total kryptonite for me! i think it's the bottle shape. it's my absolute favorite!